The Simple Life of a Queen: Still Chilly...er, COLD! and settling in here for the afternoon. 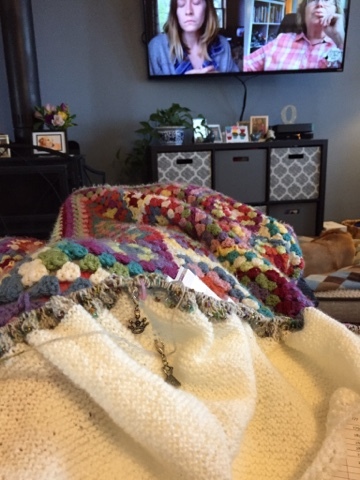 Knitting with my favorite podcasts and bundled up in lots of blankets to ward off the chill. Yes, my poppets. 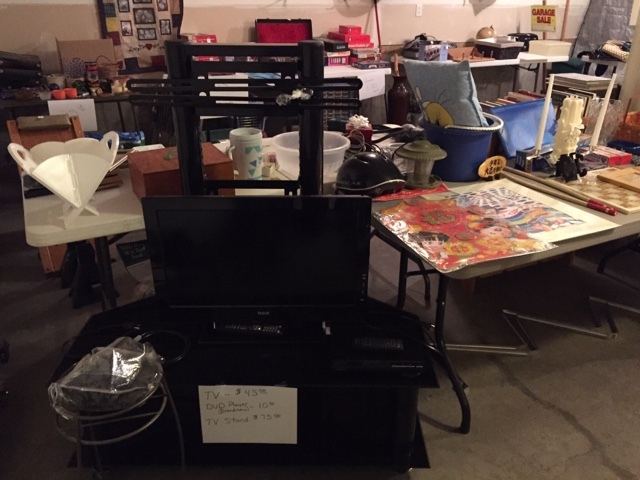 We're having the infamous garage sale on Friday and Saturday. Dennis is taking Friday off so he can help carry all the big stuff from the shed in the backyard. We have SO MUCH STUFF! I guess that's what happens after 39 years of marriage. 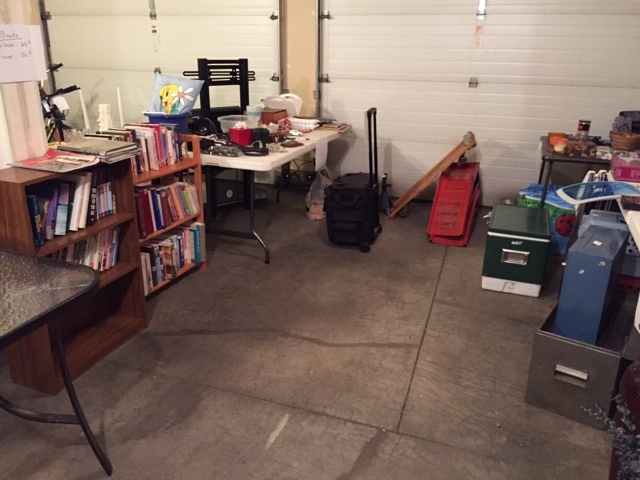 All of that "stuff" you see in the garage? You can't even tell inside the house that anything is gone! The inside of the house looks the same. So do the closets. I think the void from whence all of the stuff came, was automatically filled overnight by some evil packrat who doesn't like empty spaces. Oh well. It's supposed to be in the low 70's both days so hopefully we'll have a nice turn-out. And what was I knitting on yesterday you ask? It's my Amulet shawl. Once I got past the annoying hiccup of starting the cream section, I moved on quickly to the first lace section using the beautiful yarn I received as a prize from Knit Styles Etsy shop. Those beads. 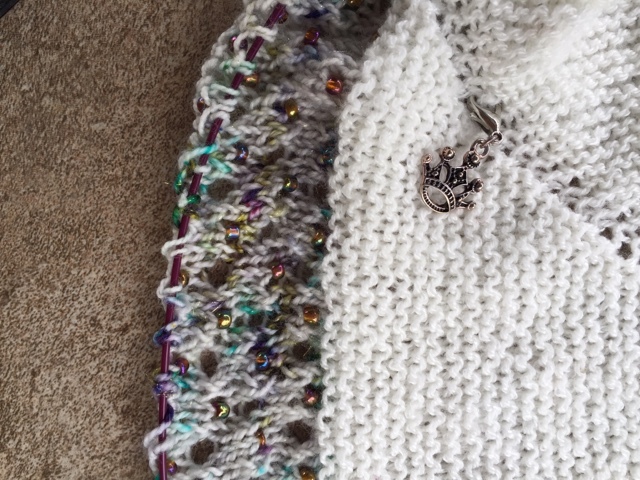 Yes, they are gorgeous, but it takes forever to do a row with beads as it means stopping every 3 stitches and getting a bead, putting it on a crochet hook, looping it onto the stitch, putting the stitch back on the needle and then knitting it. Every. Three. Stitches. And at this point there are well over 300 stitches per round and it increases every round! But although it's very, very slow going, I'm enjoying it immensely. This may be my main project for awhile and that's fine with me. I did make 2 pair of mittens which I forgot to photograph and I put a few rows on a sock, but this is my main knitterly love at the moment. 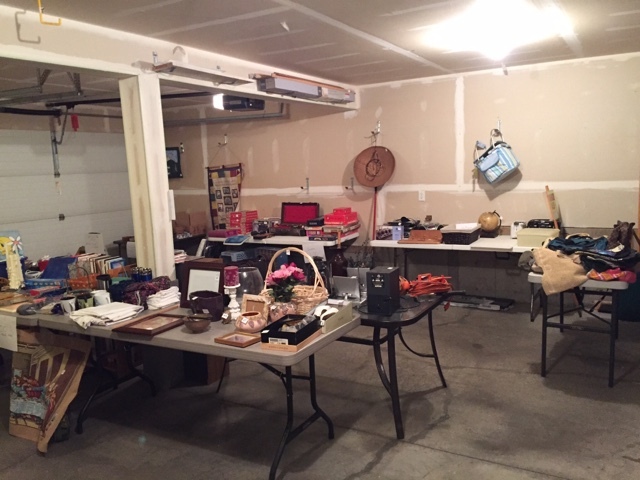 I do think something easier, needing much less concentration will be worked on during the garage sale. 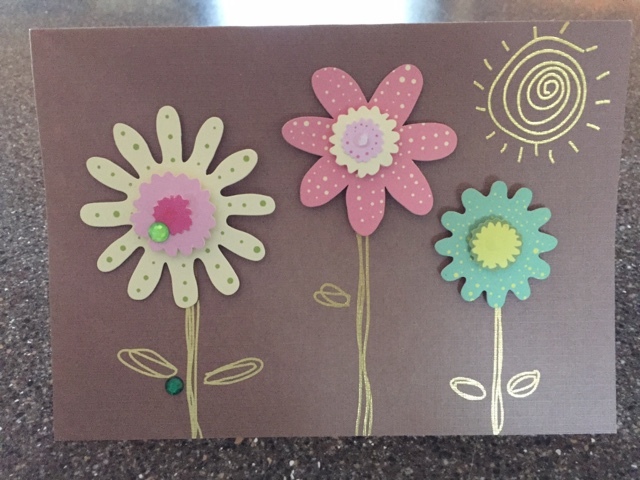 Kris from the blog "Simplify," sent me this beautiful card, just because. Don't you just love the happy flowers? Thank you Kris! 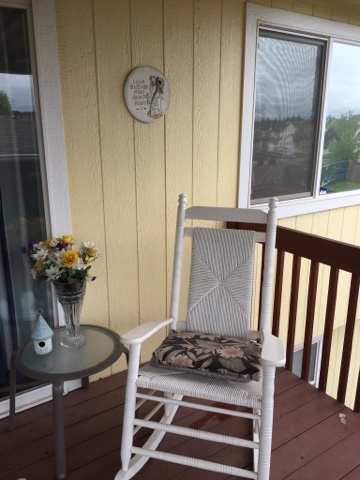 My rocking chair on the deck is waiting patiently for warmer weather for me to sit and rock, read my Bible, and drink a cup of tea in the mornings. 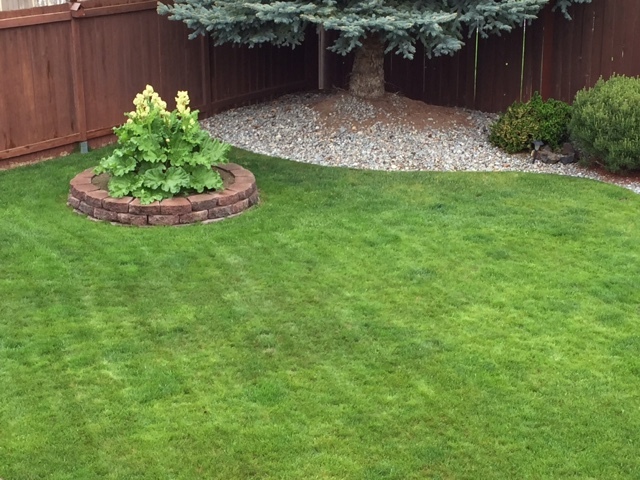 The grass is so green and lush from all of the rain. That's our little flowering pear tree that we had to replace last year after the big windstorm that blew it's big brother down onto the fence. Our neighbors had the little wishing well in the trash pile last year, so Dennis rescued it and painted it for me. I love it! The rhubarb is going gangbusters with the cool, wet weather. I've harvested several times already and it needs it again. And one last photo. 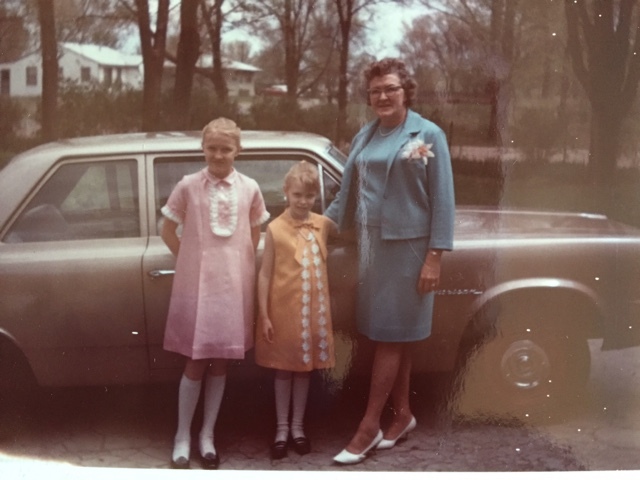 This is my Mom, sister Melanie, and I on our way to church, probably around 1965-1966 or so. Again, Mom made our dresses and I love the knee socks. My sister just lives about 3 blocks from here now and has lived there for at least 40 years, (I think it's been 40 years, I lose track of time). One brother is just 6 blocks away and another brother just on the other side of the river. Melanie sent me a house listing just one block over from here that just came on the market yesterday. Guess where she wants us to move when Dennis retires? The most recent news is that I am definitely Vitamin D deficient so they started me on mega doses of Vitamin D on Monday. I have felt kind of yucky ever since. Is that normal? Tired, tummy upset, and barely sleeping at all. I keep thinking it's just a supplement so there shouldn't be any side effects, but it is 50,000 IU in one little tiny pill! Only one pill a week. I'm told that your D3 levels should be 29 or higher and mine was 18. Let's hope this is the reason for the back not healing and I'll soon be on the mend. I thank you ALL for your sweet comments, prayers and well wishes. I feel like I've been all "doom and gloom" for awhile now and I really want that to change. Hopefully this will do the trick. And now, I have more garage sale "stuff" to do. I have to make a sign for the main road and take some more small things downstairs. This garage sale is a LOT of work. I don't know how people do them all of the time. I hope you all have an absolutely wonderful Wednesday my sweet friends! Chilly here yesterday and today - snow predicted for tomorrow and Friday. Yes, I've turned the heaters on again. How I'd love to come to your yard sale. I love finding things I can't live without at yard sales. I hope your sale is a success! Good luck with the sale this weekend! And your latest shawl is gorgeous. Hoping the Vitamin D does the trick. Another blogger was just diagnosed with Vitamin D deficiency (Nance over at Department of Nance....http://deptofnance.blogspot.com/2017/04/i-stop-somewhere-waiting-for-you.html - if you have not seen her post, please take a look. Sending prayers your way. The Mister and I spent the day doing the same thing in the basement. 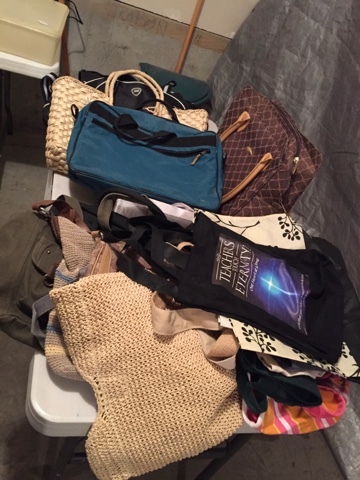 They are having a yard sale at his late mom's house this weekend and we wanted to get rid of some of the junk we have cluttering up the place. I brought a lot of stuff home from Daddio's place when we sold it and I never even unpacked it. What we ended up doing was taking a trip to the dump. It never ends. Praying your Vit D level improves. My youngest daughter is on large doses of Vit D.
Have fun with your sale. I admit I'm eyeballing that basket in the second picture and I would buy it if I lived closer to you. Nothing like a good purge. Even when I don't garage sale, I still love an annual purge. The shawl is delicious--nice work on the beading, too. You will get used to the Vit D-take it with food will help in the beginning. Hello, You made me laugh over that evil packrat that comes to stash stuff in any space we try to clean out! I am not sure about that large of a dose of vitamin D, maybe it is the time of day your taking it? Try taking it before bedtime with a bit of food! 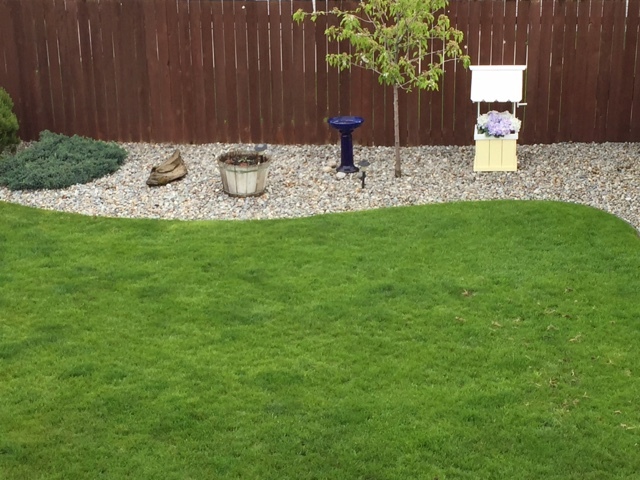 Today is overcast here and it is so green here this year! Hi Betsy, I read a lot of info about us women being Vit. D deficient as we age... I take supplements each day --but nothing like what they put you on. Hope the side effects disappear... BUT--it seems as if ALL medication produces side effects of some kind. I like the shawl you are knitting. I'd like that pattern. I'm glad there was something they found that can help you out with your vitamin D deficieny. Can't believe they made you take it all in one pill. That could bother you or not. Take some yogurt to help your tummy. I do it every day to keep my tummy happy and the rest of my intestine! If I were closer I'd be over at your house for the garage sale. Nice stuff! Take care and hugs to you my friend! Oh, I trust Jesus that the Vitamin D will soon help you to feel better, sweet friend. I had the same problem, and I think the large dose is hard to adjust to, but I do believe you will adjust, in time, and once you do, I believe you will feel a LOT better. That is a huge dose to take all at once, but the body does seem to eventually come to terms with it. 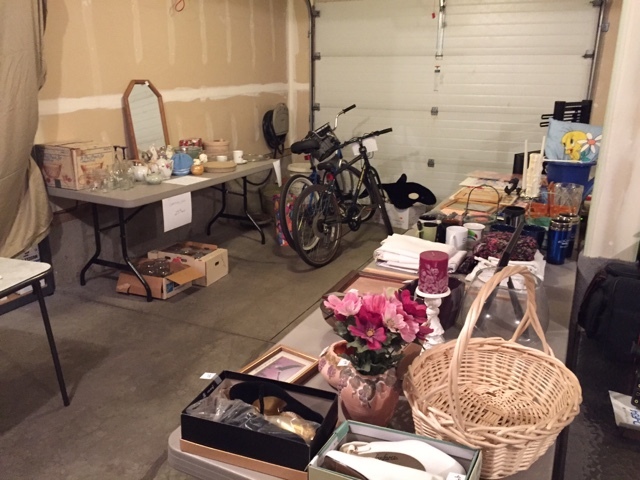 May God bless all of your garage sale efforts and send LOTS of buying customers to you!! Sending much love and many hugs your way today! Betsy, VIt D deficiency can cause some serious issues, I am glad they found it and that you are taking supplements to help. I hope y now yo have had a wonderful turn out for your garage sale. I keep taking things to the Goodwill store and yet it seems like nothing has left my house. How can that be? And how can we have so much stuff? I am sending you a special hug in hopes it helps you feel better. I hope the garage sale went well. I don't know how people do it all the time either. Seems like a lot of work and sometimes you just don't get the foot traffic you expect. Goodness, I can't imagine how much time it takes to bead that shawl. But it will be amazing in the end. As for the Vitamin D, 50,000 IU is a lot! I would say that since your body is already sensitive to so many other issues, that for sure it can cause you not to feel well if you are taking that much. I hope they don't continue that course of action for too very long. Yes, Vitamin D deficiency is a problem all over now, but the best way to get it is by exposure to the sun. Granted, that's hard when you live in a winter wonderland for most of the year. But you should expose your legs and arms whenever you can. Sending warm wishes your way and prayers for wellness. Good for you with your garage sale! They are a lot of work and I should have one but with just me it is hard to get the big stuff out of the house and then back in if it doesn't sell! LOL! Hope the D3 helps! P.S. 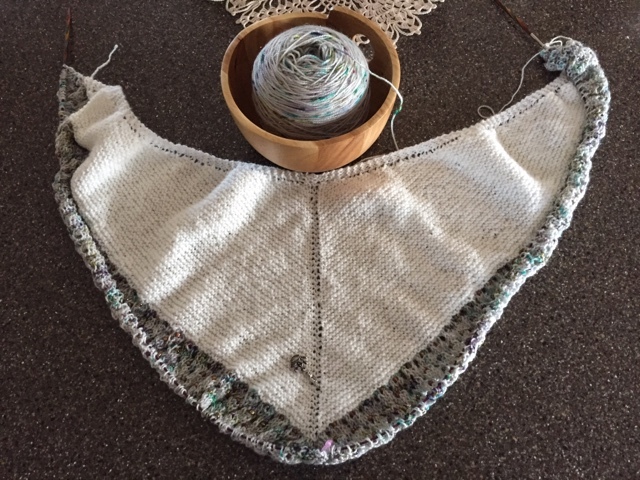 How did I miss commenting on your lovely shawl!?!? Probably because I've been up since 3:00 a.m. with storms here! LOL! Love your beaded shawl, Betsy! (I'm working with beads also but they are strung on the yarn; that's slow going.) Hope you are having a successful garage sale and that your weather is cooperating and nice like it finally is here. Not too surprising with our lack of sunshine that your Vitamin D level is down; hope the supplement works for you! Have a nice Memorial Day! Hi Betsy, I'm sorry to hear that your weather is still cold, we have been having many warm, even hot days. Your beaded shawl is going to be amazing. I do hope that your garage sale went well.